Why Buy the Tritton Warhead 7.1 Dolby Wireless Xbox 360 Headset? 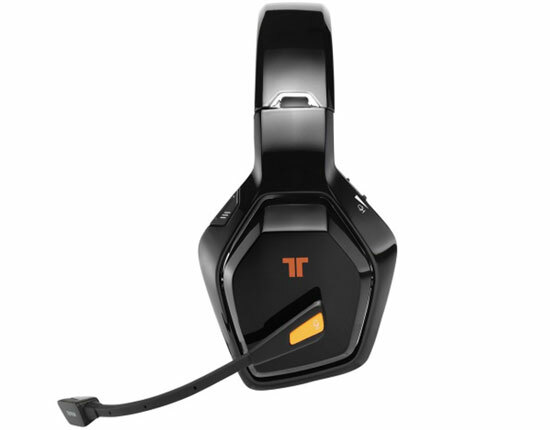 Tritton are well know for there range of high end gaming headsets like the Tritton AX Pro & the very popular Tritton AX 720 and building on the success of those headsets the have released this, the Tritton 7.1 warhead wireless headset for Xbox 360. The Warhead is the worlds first truley wireless dolby 7.1 headset and when we say truely wireless we mean it! Other headsets claim to be wireless but still require a wire from the 360's controller to the headset to use the chat function, but the Warhead 7.1 doesn't. Tritton have worked closey with Microsoft on this one ensuring every detail has been covered and as a result they have been allowed to brand the headset with the Xbox 360 logo. The Warhead features 5.8Ghz wireless technology that will provide crystal clear surround sound without interference from other devices. all this with a massive range of 10 metres. Battery issues are also a thing of the past, the warhead features a soft padded headband and super soft earcups provides extreme comfort, which is good because the Warhead also comes with two battery packs that can be swapped on the fly during gameplay, allowing for endless gameplay. Selective Voice Montoring allows you to enable or disable the ability to hear your own voice through the speakers, whilst the impressive built in equalizer allows you to choose from pre-defined settings for movies and games. The Warhead comes with everything you need to connect and play, it supports both analog and digital audio connections and even includes a digital audio adapter for HDMI Installations.